Ready to learn more about painting pin-up figures? At this point in our tutorial, the drawing is almost finished, but we’ll take some time to just go over it one last time and see what can be applied to push it even further. Add some additional light tones into the water surface right where it’s touching the sand. You can vary your color a little bit here between different blue tones as well as adding in some light yellow for the areas where the sunlight is reflecting off of the waves. First adjust the original line work under the feet and the starfish so that it’s not such a dark black. Use a darker brown color for this. After recoloring the line work you can add some additional dark brown on the color layer to unify the whole area with a nice even shadow. 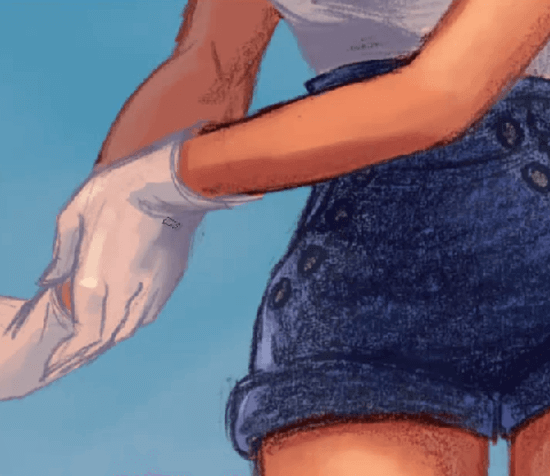 For the next part of this tutorial on painting pin-up figures, use some light brushwork to add some clouds in behind the character. 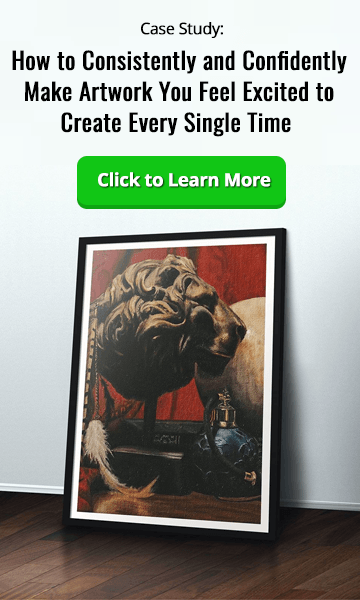 While you are working on the background for your work try to keep in mind what you are doing with the background and how it is affecting the overall composition. In the video you will see some very dramatic wispy clouds being drawn first, but the contrast of these and the sharp angles of them really doesn’t play well with the overall composition, so in the end a more subtle cloud effect is used. 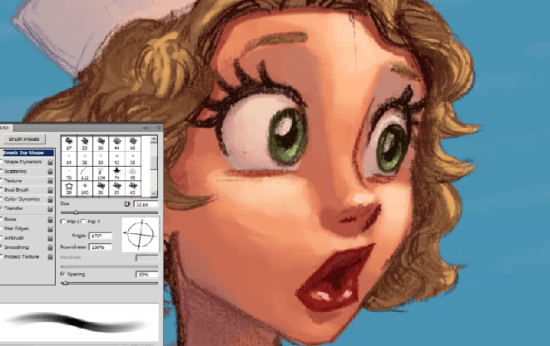 There’s a few little areas that are being cleaned up in this lesson on painting pin-up figures, and these adjustments just come from looking at the overall drawing, evaluating where can be improved or noticing if anything looks strange that should be changed, and then going ahead and fixing up those little spots. As the painting continues to get a final pass the hands and top are touched up with additional details and shading added to them. This is the same process that’s been used throughout the series. It’s good practice to flip your drawing from time to time to get a fresh look at it and see if there are any areas that jump out at you that may need to be fixed. 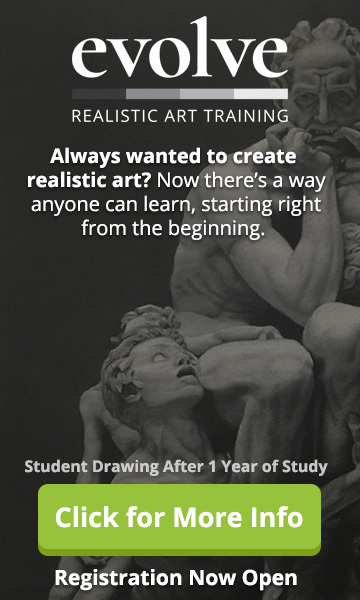 The reason that this is so effective is that while you are working on the drawing from the same angle for so long it’s easy to get used to seeing a mistake to many times that you become oblivious to it. By flipping your canvas any mistakes like this should jump out at you. Obviously the more you progress as an artist will make it easier to spot these mistakes. As a final step to unify and make the whole painting really pop you’re going to want to add a simple lighting gradient on a separate layer over top of all the other layers. With the lighting layer created the blending mode for it is set to overlay, which will let the light colors from the layer be applied to those below it. Once your layer is setup, apply a gradient to that layer with pink to white color values. The pink should be at the top of the image and then fade towards white as it travels downward. This final step in our painting pin-up figures tutorial adds a lot to the finished painting and you can see how it looks as the lighting layer gets turned on and off in the video. That’s it for this lesson series on painting pin-up figures. 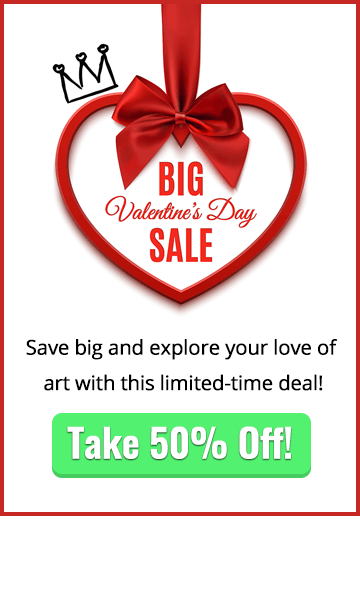 We hope that you learned a lot about digital painting and can take some of the things you learned here and start applying them immediately to your own work!